I started this "series" a while back and realized that I've been neglecting it, so here's another installment. So FreeHand has a feature called Copy Attributes, and another called Paste Attributes. Basically, you select an object and rather than copy the object itself, you copy its attributes. You can then select another object and apply the attributes you copied by choose Paste Attributes. It's a nice setting because it allows you to keep several objects on your page (yes, it works on text objects too), and then quickly apply those settings to artwork that you're working. It's nice, but it's clunky. In contrast, Illustrator employs an Eyedropper tool. Normally, the job of the eyedropper tool is to pick up or "sample" the color from an object that you click on (shift-click to sample colors from placed images). In that way, you can easily create a new swatch. However, the Eyedropper tool in Illustrator also has the ability to APPLY the attributes that it samples. This makes the tool incredibly useful, and you would use it as follows: Select an object that you'd like to change. Switch to the Eyedropper tool and click on any other object in your file. The selected object will take on the attributes of the object that you clicked on. 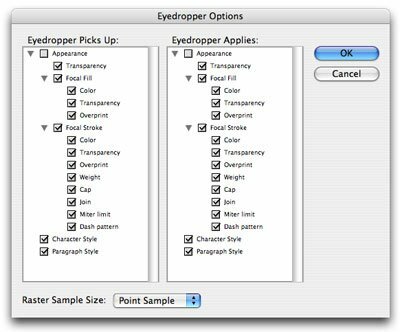 What makes the Eyedropper tool so powerful is that you can control exactly what attributes are sampled. By choosing the option to sample the full appearance of an object, the Eyedropper can sample effects like Drop Shadow and 3D. And of course, you can set the Eyedropper to work on text as well.